The Milli-Q Advantage system has been designed to deliver high-quality ultrapure water adapted to every user’s needs in today’s laboratory environment. The Milli-Q production unit is a compact system that can be placed either on the bench, under the bench or on a wall–wherever it best suits you. The Q-POD (Quality-Point-of-Delivery) unit provides final polishing at the point-of-use, delivering ultrapure water adapted to specific needs. The Q-POD’s interface simplifies operation and displays essential data for complete user reassurance. Up to three Q-PODs can be used with each production unit at different locations within the same laboratory. 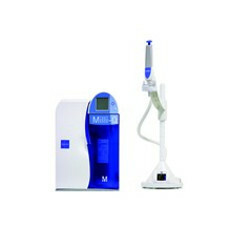 Shop a wide selection of MilliporeSigma Milli-Q Advantage A10's on LabX. Find new and used pricing to meet your lab needs. Choose from top brands in our marketplace.